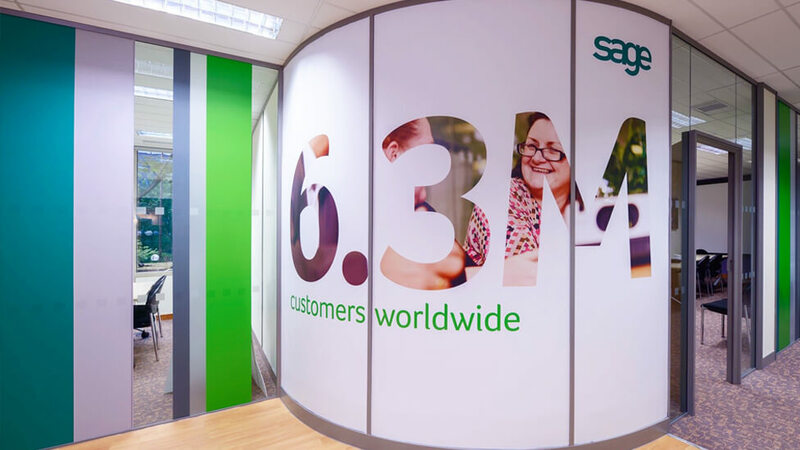 We produced an impactful workspace design solution to increase engagement by celebrating Sage’s achievements and the employees who make the company a success. Companies are increasingly realising the effect that the work environment can have on employee engagement, which in turn plays a major role in staff performance. Businesses are also focused on maximising the investment made to acquire top talent, so staff retention is a top business priority for many organisations. In an effort to keep employees motivated and focused on achieving results, Sage set out to boost their office environment and atmosphere by celebrating staff achievements in a very visible way. The new workspace design had to create a sense of camaraderie and fun that would encourage collaboration and team work, without losing focus on presenting Sage as a mature company focused on results, and confident in their employees’ abilities. We produced an inspiring workspace design that energises teams by putting people and their efforts at the forefront. Our solution highlights the importance of employees as individuals who make valuable contributions, and the difference employees make to their colleagues and the company as a whole. We placed large scale photographs of employees – the result of a 2-day photoshoot we organised – next to messaging from Sage’s brand. This approach allowed us to maximise the impact of the space being used, and helped instil a sense of motivation and pride in one’s work and achievements. With different teams distributed over 5 different floors, we worked closely with our client to ensure that all employee photos were placed on the floor they worked on, further contributing to a feeling of ownership and belonging, and helping to foster dialogue and interaction amongst teams that may not necessarily work together often. The photography style presents employees as friendly and approachable, and also emotionally invested and committed to contributing to the success of the company. We highlighted the importance of business results with the use of impactful fonts, and applied a cut out effect to reveal the employees behind those achievements. The combination of these two design elements acts as a motivational tool for employees, as it further reinforces the importance of individual contributions, as well as serving as a constant source of communication of the company’s ambitious goals. The scale of the photography and graphics helped us evoke the magnitude of the data staff impact on a daily basis, and helps them focus their attention. We used a variety of materials for the different surfaces within the workspace, helping maximise the investment made, as well as the effectiveness of the design. Digital wallpaper, vinyls on glass, and branded directional signage all contribute to a consistent message throughout the office. We produced all the design and managed the print, and committed to installing it all in just one weekend – including evenings – to minimise disruption to the teams.